Students can choose from 46 major programs and 49 minor programs. The student-to-faculty ratio is 8:1. 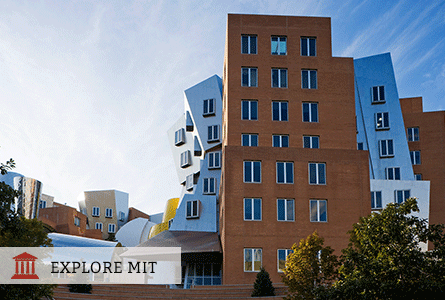 MIT is organized into 5 schools: about 65% of students major in the School of Engineering, 26% in the School of Science, 3% in the Sloan School of Management, 4% in the School of Humanities, Arts, and Social Sciences, and 2% in the School of Architecture and Planning. MIT's Undergraduate Research Opportunity Program (UROP) gives students the chance to work on cutting-edge research. During Independent Activities Period (IAP), a special 4-week period in January, students can pursue their own educational interests and goals. MIT undergraduate and graduate students can cross-register to take classes for credit at Harvard University, Wellesley College, Massachusetts College of Art, and The School of the Museum of Fine Arts without paying additional tuition. Advising is available for students interested in legal and health professions. 39% of MIT graduates go directly to graduate or professional school after finishing their Bachelor's degree. 75% of MIT graduates will eventually go to graduate or professional school, including 9% to medical school and 3% to law school.